If you are passionate about food and love meeting artisan producers and wanting to learn some chef’s skills from some of the best, then this is the place to be. The Producers Pavilion will be a sensory explosion of tastes, smells and visual delights and will be home to some of Australia’s finest boutique producers where you will have the opportunity for free tastings or to purchase their products. Producers include: Brookies Gin, Caldera Fine Foods, Coyo Yogurt, Kenilworth Cheese, Meredith Dairies, Padre Coffee, Pomodoras Balsamic Dressing, Pretty Produce/Green Cauldron Farm and Woombye Cheese. The Producers Pavilion will also feature the Chef’s Skills Table presented by Olsson’s Salts and MC’d by Queensland Taste Editor, Anooska Tucker-Evans. The Chef’s Skills Table sessions feature a range of chefs including Colin Fassnidge, Matt Wilkinson, Miguel Maestre, Kirsten Tibballs, Alanna Sapwell, Adam D’Sylva, Zack Furst, Brendon Barker, Charley Snadden-Wilson, Jordan Toft and Steve and Will from MKR. Located in the heart of the Festival Village under the beautiful Sperry Tent, the Pimm’s Garden Party is everything you would expect from Pimm’s. A stylish space complete with various seating options (the perfect zone to people watch) and of course delicious drinks from Pimm’s! Hipsters rejoice – the Craft Beer & Cider Corner is your place! Noosa’s version of a beer garden complete with live music and dj’s turning out cool vibes throughout the day. Together with Asahi premium beer, the Craft Beer and Cider Corner with feature some of the region’s best craft brewers in action. Beers and cider include 4 Pines Brewing Co, Balter Brewing (voted number 1 in 2018), Brick Lane Brewing Co, Eumundi Brewery, Hawkers Beer and Stone & Wood (voted number 2 in 2018). Presented by Olsson’s Salts under the canopy of a stunning Yurt, the masterclasses are an opportunity to see some of the visiting chefs and winemakers in an intimate setting. Olsson’s Salt will naturally be a theme throughout the classes and local produce will be in the spotlight. Guests include Colin Fassnidge, Giovanni Pilu, Matt Wilkinson, Adam D’Sylva, Shaw + Smith Winemaker, Adam Wadewitz, cheese expert Peter Gross and more. The masterclasses can be pre-booked at $20 per class ($30 for wine masterclasses). Some of Australia best chefs will present cooking demos on the Main Stage including Miguel Maestre, Colin Fassnidge, Matt Sinclair, Paul Carmichael, Alessandro Pavoni, Giovanni Pilu, Matt Golinksi, Matt Stone, Zack Furst, Jo Barrett and Matt Wilkinson. Enjoy tastes from some of Noosa’s best restaurants across the weekend including Arcuri, Boardwalk Bistro on Hastings, Bombetta, Embassy XO, Padre Coffee, Providore on Hastings, Sum Yung Guys, View Restaurant and Village Bicycle. What’s a food and wine festival without great wine? Some of Australia’s best wineries will be in the Festival Village including Cape Mentelle, Cloudy Bay, Chandon, Chandon S, Clairault I Streicker Wines, Dal Zotto, De Iuliis Wines, Devil’s Corner,Hill-Smith Family Wines, Hollick Wines, Innocent Bystander, Irvine Estate, Journey Wines, Ocean Eight Winery, Pizzini Wines, Polperro Wines, Sharmans Wines, Shaw + Smith, Tellurian Wines, Turkey Flat Vineyards, Veuve Clicquot, Wairau River Wines, Yabby Lake, Yering Station and Xanadu Margaret River. Enjoy a line-up of performers across two stages from early afternoon through to dusk, including DJs and bands Tijuana Cartel, Koi Boys, Funk N Stuff, The Most and more. The Hamptons themed VIP lounge is the place to be over the festival weekend. You will be welcomed by the OpenTable Hostess and have the opportunity to meet guest chefs throughout the day. With limited tickets available to this exclusive venue, you will receive four complimentary drinks per day while enjoying an all-day grazing table prepared by the VIP Lounge Festival Chef. There will be wines by Xanadu Margaret River, along with premium Japanese beer Asahi Super Dry and refreshing water by San Pellegrino. There’s also the VIP satellite lounge complete with Chandon Bar close to the Main Stage to see all the action! The Festival Village will open Saturday 19 and Sunday 20 May from 10am – 8pm. Tickets start at $30 for adults, $15 for children and a weekend pass costs from $50. The OpenTable Festival Village VIP Lounge costs $150. Entry to the Festival Village includes a complimentary glass of wine by Xanadu Margaret River and a Noosa Food & Wine glass. Drinks from Wineries start at $3 for a 50ml taster and $8.00 for a 150ml glass. The Festival Village is an all-weather event. Getting to the Festival Village is easy – thanks to the Noosa Food & Wine Festival Bus roaming between 9.30am and 8.30pm from the Noosa Transit Centre and The J in Noosa Junction to the Noosa Lions Park every half hour! The Festival Village is a cashless event so bring your debit card, credit card, phone (with mobile wallet enabled) and get ready to 'tap & go'. Every restaurant, winery and producer will only take payment with a Visa, MasterCard or Amex debit or credit card or your smart phone with 'tap & go' functionality. Regional Flavours: The sunshine state’s must-do food and wine festival! From lazy, waterfront cocktails to a bustling market, celebrity chefs and beyond, Regional Flavours presented by The Courier-Mail is Australia’s largest free food festival. Started 10 years ago and held this year on 21-22 July in the stunning South Bank Parklands, the event will again showcase Queensland’s best fresh produce and gourmet ingredients. Celebrities on the Main Stage On the Main Stage in the South Bank Piazza, the specialty dish is entertainment – served fresh from Australia’s best celebrity chefs and culinary experts including Network Ten’s Matt Preston, Gary Mehigan, George Calombaris, Miguel Maestre, food goddesses Sarah Wilson, Katherine Sabbath, Jessica Sepel and global flavour connoisseur Adam Liaw. See how to create mind-blowing flavours and street-hawker-worthy meals at home, take in a tutorial on cooking with Queensland seafood, start to incorporate sustainable, plus much more. Entry is free, but spaces are limited, so arrive early to secure your seat. Queensland Taste Stage and Marketplace The thriving Queensland Taste Stage and Marketplace featuring more than 80 stalls from across the state will have a distinct theme of healthy alternatives, gluten and dairy free ingredients as well as vegan and vegetarian foods. On the stage, local chefs will walk you through exquisite recipes using local produce – think black garlic from Gympie, brilliantly-coloured Lockyer Valley beetroots and melt-in-the-mouth Moreton Bay seafood to name a few. Picnic Patch Located on the Little Stanley Street Lawn, Picnic Patch will be abundant with masterfully decorated tables, parlour games, cosy blankets and scrumptious food stalls offering fresh produce from the Lockyer Valley. Kick back in the winter sunshine and taste the tantalizing flavours of Australia’s salad bowl. Future Food pavilion Take a glimpse into the crystal ball and hear from leading experts on what trends and insights you might expect on your dinner plate now, and in 2050 at the Future Food pavilion. Discover 3D printed food, smart horticulture and more, plus cheer on recent participants in the Future Food Business Acceleration Programs in the daily Grill to Till pitch competition. The Hunting Club Presented by Meat and Livestock Australia and The Charming Squire, The Hunting Club is part bar and bistro, part stage in a fabulous fusion of Queensland’s meat and malt scene. Open exclusively at Regional Flavours, you can head along for lunch, dinner and all-day grazing prepared by popular South Bank restaurateur, The Charming Squire. The Hunting Club also features special, extended opening hours – from 5pm until late on Friday 20 July, and 10am until late on Saturday 21 and Sunday 22 July. Kids Collective Pint-sized gourmets can enjoy a spot of food-focused play at the Kids Collective. Located at Central Café Lawns & Arbour View Lawns, Kids Collective lets children get their hands dirty with the Potato Journey by OzHarvest, a truly immersive experience of the life of a humble potato. There’s also a range of colourful craft activities to enjoy including edible fruit caterpillars, rainbow-coloured nutrition and book readings from Brisbane City Council Libraries. River Quay If rest and relaxation in palatial surrounds is what you desire, venture to River Quay presented by eatSouthBank. At Regional Flavours’ most luxe location, revel in the gentle hum of mellow tunes plus food and cocktails from some of South Bank’s five-star restaurants; Stokehouse Q, The Jetty, River Quay Fish, Popolo and Aquitaine at River Quay. Open from 10am until 8pm, so you can savour that spritz just a little bit longer. Is your appetite whetted? To plan your day and experience Australia’s largest free food and wine festival, head to regionalflavours.com.au . What was once the domain of the professional chef, sous vide , is now accessible for the home cook. We look at the many advantages of this remarkable cooking technique. 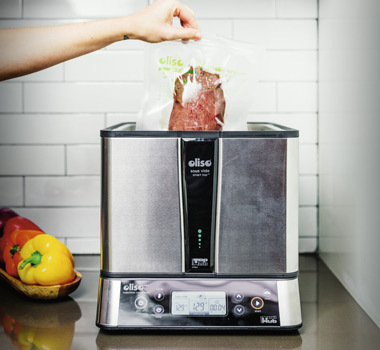 In the early 1970s, French scientist Bruno Goussault developed the most significant advancement in the recent evolution of cooking – he called it sous vide. Literally defined as ‘under vacuum’, it should really be called precision controlled cooking, because that is far more ‘precise’. 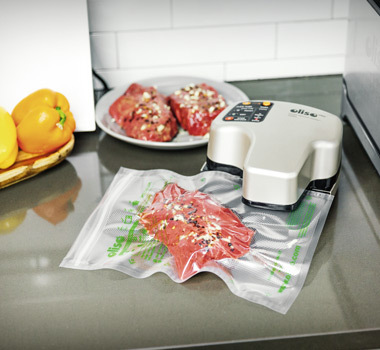 Basically defined, sous vide is sealing an item of food in a plastic vacuum pouch and then submerging it in a water bath so it can be cooked gently and slowly at a precise temperature. It is a technique used by some of the world’s best contemporary chefs, including Heston Blumenthal, Thomas Keller, Joel Roubuchon and many more. If you’ve ever wondered how the chef at your favourite hatted restaurant manages to get your steak cooked perfectly through, but still maintain its moisture, how the vegetables not only look vibrant and colourful, but also taste crisp and flavoursome, chances are it has been cooked sous vide. Up until recently, it was only the domain of the professional chef. 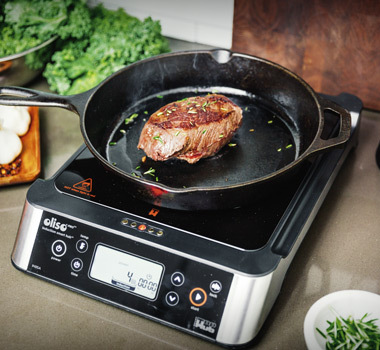 But advances in technology and the more affordable cost of equipment have made sous vide cooking accessible to the home cook. 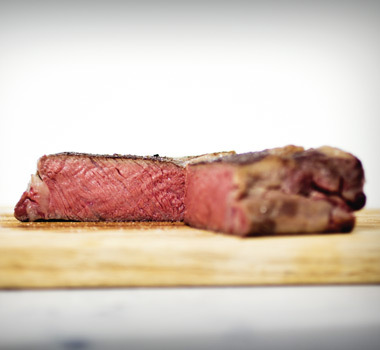 Those who try it, swear it is the best way to cook food perfectly and to get the best flavour and texture – all that combined makes a compelling argument for sous vide cooking. The process is fairly simple – plan well ahead, use great ingredients, vacuum seal, cook using the Sous Vide water bath and cool gently. That’s it. The secret to some of most delicious recipes from the world’s greatest chefs is within your grasp. Create your own festive cocktails in Über style! Über Bar Tools are the perfect festive gift for that special someone who loves wowing their guests with fabulous cocktails. Designed in Australia with the opinions of professional bartenders in mind, the Über range is huge, ranging from tools to help you stir, pour and measure to shake, strain, muddle and much more! With their intelligent shapes, high functionality and eye-catching materials, Über Bar Tools are committed to igniting the senses. If your goal is to master the world of cocktail making, consider Über Bar Tools your ladder to success. 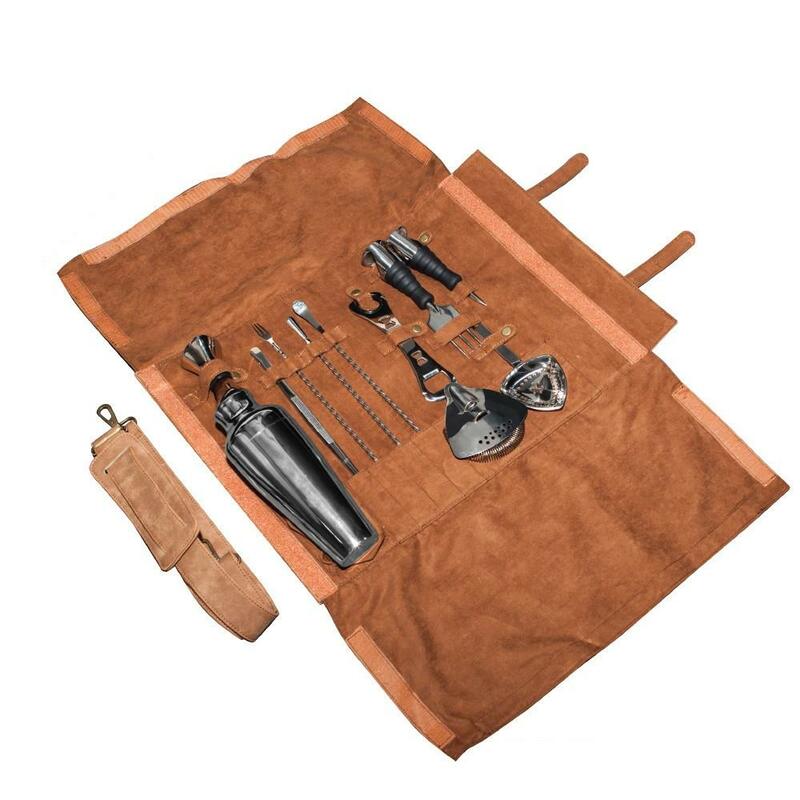 Get ready to rock with an Über Bar Tools cocktail set! Available in your choice of bronze, silver or gold, it has everything you need to get started straight away. Measure every drop accurately, consistently and responsibly, as well as minimise waste, with the Über ProMegJig TM . Shake your cocktail up in the ergonomically designed MShaker, then strain it with the Über BarRay and scoop your ice using the Juliep TM . With the Über ProTeadrop TM , you can not only stir your cocktails, but also use it to muddle, layer, measure and reduce Champagne bubbles. The mint julep and Moscow mule are two of the world’s most iconic cocktails, demanding their own special vessels. The Über Bar Tools Julep Cup comes in chrome and copper and will bring out the best in your mint juleps, while the mule mug, also available in chrome and copper, will take you back to 1940s New York with its authentic design. The Über LuxRoll™ is a smart 11-piece water-resistant roll kit offering complete bartending tools. 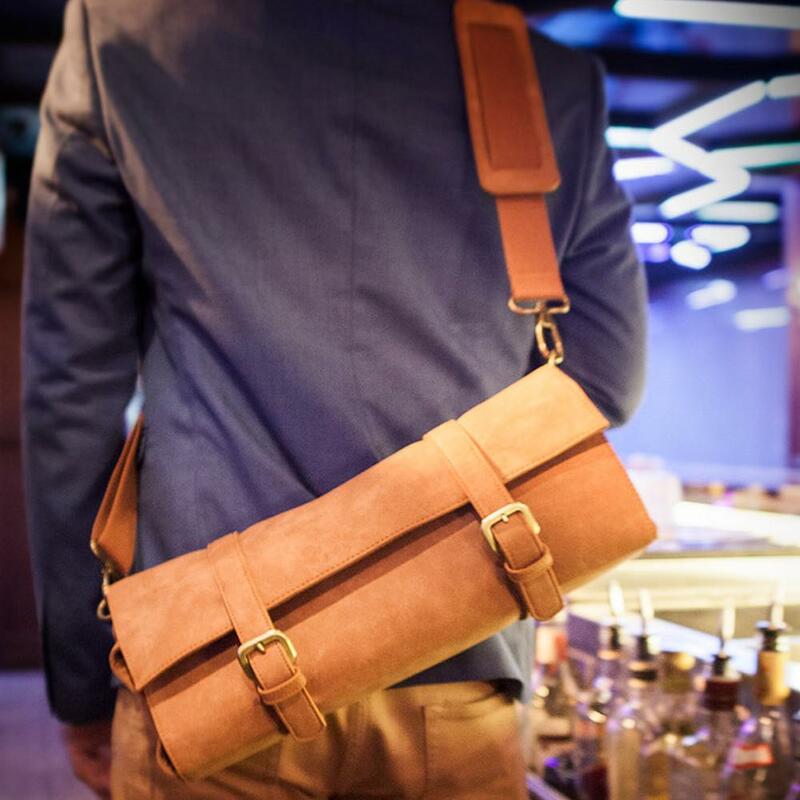 Made from leatherette with a heavy-duty shoulder strap, it’s perfect for work or the travelling bartender always on the move. The LuxRoll™ is ideal for measured cocktail making and is used worldwide by professional bartenders for efficient Bartending. When bar tools are better than “great”, and better than “awesome”, they become Über Bar Tools! To find out more visit www.uberbartools.com or visit Peters of Kensington to order.